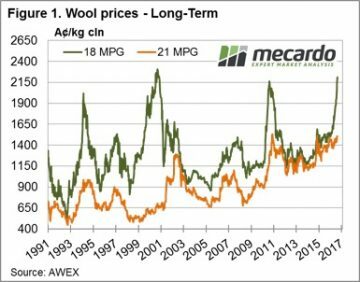 A review of prices and sentiment 12 months ago, helps explain the euphoria that wool growers are feeling at the moment. Back then fine wool was at all time low premiums to medium wool. Fast forward to now and the AWEX reports note that it’s the fine wool that is driving the market. This was a big week for prices on top of a stellar run over the past few sales. The EMI lifted 24 cents, but with a stronger Au$ it was 43 cents higher in US$ terms. 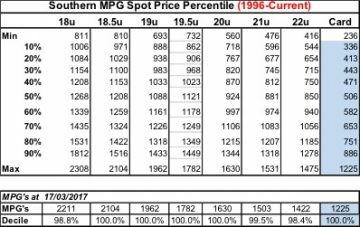 To pick a MPG category, 18.5 was quoted +80 cents in Melbourne, +95 cents in Sydney and +59 cents in Fremantle over the week. One way to put perspective on where prices are relative to the past is via Percentile Tables. 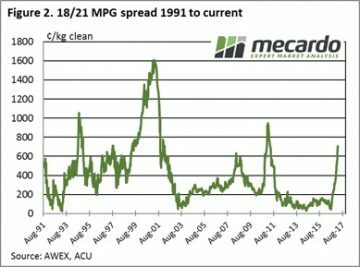 Since 1996 only 18, 21 & 22 MPG have reached higher levels, that is for 100% of the time since 1996 the market has been lower than the current price for all other Merino micron types. No doubt a fitting reward for those that have stayed the course and are now selling wool at very exciting prices. Like all markets, high prices don’t last forever. One theory is that “high prices are the antidote for high prices”; that is high prices encourage increased production which then causes prices to fall. Due to the low sheep numbers, and the competition from other farm activities (prime lambs are also very attractive), any increase in wool production will be slow at best. Coupled with the virtual non-existence of any wool stocks either on farm, in brokers stores or in mills; then the outlook has little supply pressures ahead. So, is this time different? Usually there is some analysis that says the current rally (note the sharp spike in 18 MPG Fig 1.) will be different from the past and not have a correction. 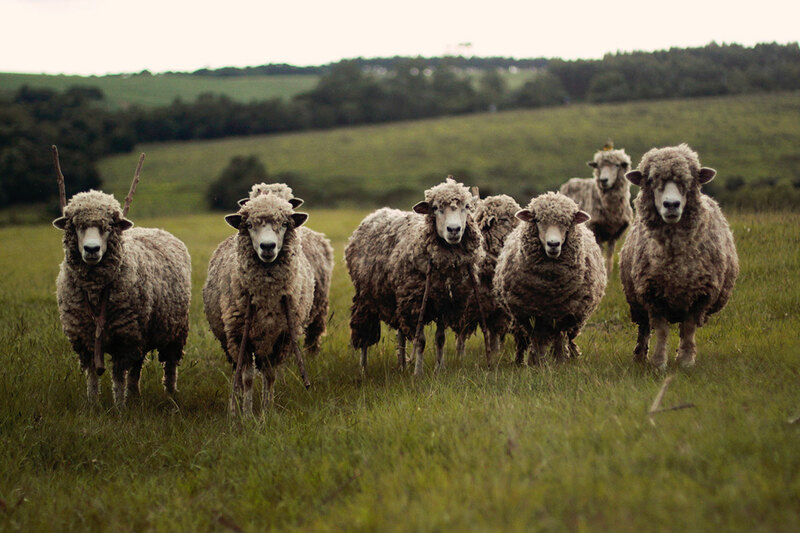 At this stage I don’t think anyone really knows, but caution is the best way forward and fine wool should be sold as available and forward sales for future production progressively made. The market in Fremantle closed a little softer for 20.5 and coarser wool so some caution for the 2 day sale next week. A increased offering of 51,200 bales is rostered for next week, over 10,000 up on this week’s clearance of 39,800. In subsequent weeks though, AWEX is forecasting back to 42,000 bales per week.